Your Man And His Mom. What His Relationship With Her Says About Him? It’s nothing new. It’s something people have talked about for decades, centuries probably! 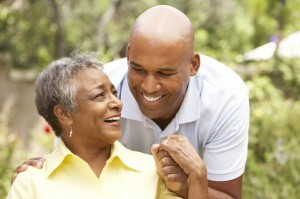 How a man treats his mom is pretty much an indication of how he will treat his lady. Sure, there are some exceptions, but you can pretty much determine what kind of man he is by his relationship with dear ol’ mom. 1. The nurturer – if he has a mom who is loving and nurturing, he will tend to be sensitive to you and he will also be more attentive than the average Joe. Guys like this love their moms and appreciate the fact that she gave them value and values, both. He will be respectful. But be careful – there’s a line between being a good man and a mama’s boy. Also, if he is an only son or if he still lives with her, beware. She may not think you (or anyone else) are good enough for him and she will do what’s necessary to keep him. 2. Not so close – if he is not close with his mom, well, he may be a bit more difficult to figure out. It could take a minute. He will show respect, but he may not be as affectionate and may not be sure how to show you love. However, he can be smoother over with a little love. 3. The strainers – these are the dudes who did not develop close and loving relationships with their moms. They need a lot of work, typically. And they may be more trouble that they are worth. Why? Because they really have little respect for women. And they really aren’t into commitment. If things start to get serious, he will find a way to create friction and end things. 4. The copycat – he’s the one who does what mama tells him. For some strange reason, he never established a mind of is own. He’s not a keeper, either. These tendencies are not etched in stone, but you can pretty much gauge your man’s behavior by how his mama raised him. So if he wants you to go to a family reunion or family wedding, it might be a good idea to go and check out his relationships with the women in his family!